The govt, which provides material for the President\'s speech, even mentioned the reduced price of \"LED bulbs\"
Let's play a game. 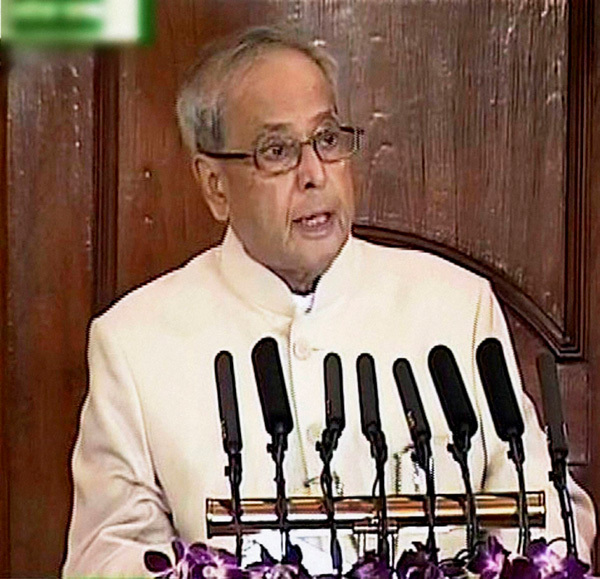 Search Google for President Pranab Mukherjee's address to Parliament on Tuesday, 23 February, and Congress president Sonia Gandhi's speech on the previous day. Now read them back to back. You think they were talking about different countries? You are forgiven. That's just how contradictory the President's (and the government's) view is from the Opposition's. Mukherjee: This is a season of renewal and growth. Gandhi: The country is going through the most disturbing circumstances, that are causing grave disquiet across the country. Mukherjee: The government is committed to a confident, strong and forward-looking India, where even the last person should be empowered. Gandhi: The government seems to have lost all sense of balance, and of proportion. 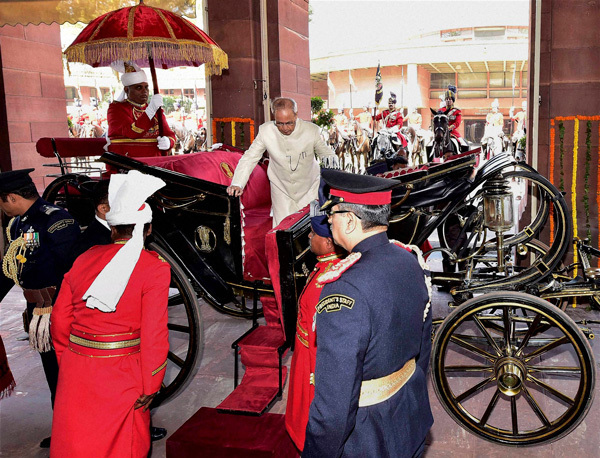 Mukherjee: The government's focus is on social justice and inclusion. Gandhi: The government is demeaning social justice by callousness to victims of caste discrimination. Mukherjee: Democratic temper calls for debate and discussion, and not disruption or obstruction. Gandhi: The government appears determined to undermine all democratic norms and hell-bent to destroy...the spirit of debate and dissent. See the contrast? It's an easy indicator of what the debate on the President's address in both houses of Parliament will look like. The Opposition is likely to tear into the empty boastfulness of the government's claims, made through the Presidential address, attempting to drown out the most pressing issues in public consciousness. The speech began with Deen Dayal Upadhyaya and ended with Subhash Chandra Bose. Here is a look at some of the most surprising aspects of what was in between. A haven of stability in a turbulent global economy: The government claims that GDP growth has gone up so much it has made India the world's fastest growing economy among large economies. The truth is the NDA government's GDP growth rate numbers have been suspected by a large number of analysts, including the RBI Governor, ever since the government changed the method of computing them. Decline in inflation: The reality is, retail inflation just hit a 17-month high, rising 5.69% year-on-year in January. Retail food rices, especially, went up by 6.85%. Jump of 12 places in World Bank's Ease of Doing Business rankings and 39% increase in FDI inflow: US Ambassador to India, Richard Verma, recently said India still needed to do much more to convince American companies to invest here. Even the FDI numbers, Verma said, were not what they should be and American investors were looking at other parts of Asia such as Singapore, Vietnam and Thailand. Industry leaders, such as Harsh Pati Singhania, have echoed these sentiments, saying consumer demand in the country is still low and private investors are not feeling encouraged. Success of Make in India: The NDA government's buzzword was mentioned five times in the speech, and was given credit for a range of aspects from job creation to increase in FDI inflow to infrastructure building. In reality, industrial production in the country has gone down. That too, at a faster rate than expected. In fact, production of capital goods like machinery and tools went down by nearly 20% in December year-on-year. Industry captains also say that over a year after its announcement, no headway has been achieved. Revitalising public sector banks: The government claimed that the Indradhanush programme is revitalising public sector banks to ensure credit flow in the economy. Public sector banks are far from revitalisation, and are under massive scrutiny for the alarming amount of bad loans that have left them stressed. Focus on poverty eradication, farmers' prosperity and employment generation: The speech claimed that the government was focusing on these themes at a time when it is facing huge Opposition onslaught for being anti-poor, anti-farmer and anti-youth. Job creation in eight major sectors of the economy has come down, thousands of farmers have committed suicide and, thanks to rising prices, essential commodities are being driven far beyond the reach of the poor. One Rank One Pension: The government claimed to have fulfilled its commitment to implement OROP, even as army veterans are planning to move court against non-implementation of OROP as promised by the government. Well-being of farmers: The government said it has attempted to ensure farmers' well-being by merely renaming the 'Ministry of Agriculture and Cooperation' as the 'Ministry of Agriculture, Cooperation and Farmers' Welfare'. It also claimed credit for launching a new crop insurance scheme, whose provisions have fallen far short of the National Commission for Farmers' recommendations, as well as the farming communities' expectations. Social justice: Quoting BR Ambedkar's stress on social democracy, the government claimed it was striving for social justice by celebrating Ambedkar's 125th birth anniversary, by celebrating the day the Constitution was adopted as Constitution Day and by working to preserve what it called the 'Panchatirthas', the five sites of Ambedkar's legacy. Even as this speech was being delivered, thousands of protestors were marching not far from Parliament, demanding justice for the suicide of Dalit PhD scholar Rohith Vemula. Boasting on trivia: Perhaps as an indicator of a lack of concrete achievements to congratulate itself for, the government actually used the President's address to a joint sitting of Parliament to announce that it has brought down the price of LED bulbs. Reinforcing one-man government: The President's address is an opportunity for the entire government to present its report card to the entire country - not just the Prime Minister's report card. 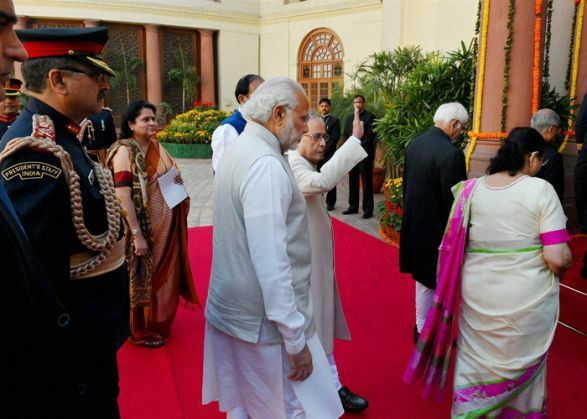 As leader of the government, mentioning the PM may be unavoidable, but this was the first time President Mukherjee lauded a PM by name in his four addresses to Parliament (2013-16). "Dedication of the Afghanistan Parliament to its people by Prime Minister Modi was our contribution to Afghanistan's pursuit of peace and prosperity," Mukherjee announced, leading to a round of applause from the assembled MPs. Ever since the visuals of Modi sitting on a high-chair seeking accountability of the Union Cabinet Ministers went public, he has consistently drawn criticism for portraying that he runs a one-man government. This gesture, too, seemed to emanate from the same tendency. Adding to the polarising nationalism debate: Mukherjee ended the address by quoting Netaji Subhas Chandra Bose to add to the debate on nationalism that has polarised public opinion in the aftermath of the JNU episode. "Nationalism is inspired by the highest ideals of the human race, Satyam, Shivam, Sundaram," Mukerjee said, urging the country to embrace these ideals "as we stake our claim on the future". Bose's equation of nation with God and nationalism with worship is in sync with the Hindutva thrust on national pride above all else. It falls neatly in line with the Sangh Parivar's emotive politics. Mukherjee's concluding words may also be an indicator of the government's strategy to aggressively counter the Opposition's campaign on the JNU episode. Government leaders in Parliament might play on the front foot, continuing to harp on what has been so far portrayed as the JNU students' assault on the nation with their slogans.